The tantalum capacitor is similar to the electrolytic capacitor, but using tantalum within the construction of the capacitor it is able to offer extremely high levels of capacitance for any given volume. Volumetric efficiency: Tantalum capacitors offer a very high level of volumetric efficiency – much greater than many other types. In particular they are better than electrolytic capacitors which are their main rival. Good frequency characteristics: The frequency response of tantalum capacitors is superior to that of electrolytic capacitors. This means that they are more suitable for use in a number of applications where electrolytics could not be used. High reliability: Tantalum capacitors are more reliable than many other forms of capacitor. Provided they are operated within their ratings they are able to provide an almost unlimited life. Their use is not time limited as in the case of electrolytic capacitors. Wide operating temperature range: Tantalum capacitors are able to operate over a very wide temperature range. They are often specified for operating over the range -55C to +125C. This makes them an ideal choice for use in equipment for use in harsh environmental conditions. Compatibility with modern production methods: Modern production techniques often expose components to high temperatures during soldering as the whole assembly is heated by infra-red heat. Using conventional leaded components only the board surface was heated and the amount of heat conducted by the leads was usually insufficient to damage the components. Tantalum capacitors are able to withstand the temperatures of SMT production and are there fore ideal for use in many new electronics designs. Tantalum capacitors have a number of disadvantages, and these need to be considered when using them in new designs. Low ripple current ratings: It is hardly surprising in view of their size, that tantalum capacitors do not have a high ripple current rating. They should not normally be used in areas that require any levels of current to be passed. Not tolerant to reverse or excess voltage: Tantalum capacitors do not like reverse or excess voltage. Even spikes can destroy them. If they are exposed to excess or reverse voltages then they can explode. 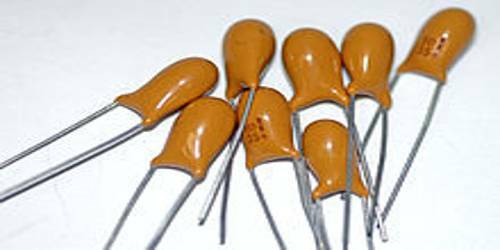 More expensive than other types: Tantalum capacitors are more expensive than many other forms of capacitor. As a result their cost should be considered during the design phase as the other benefits may outweigh any increased costs.